In the Green Mountain State, sweet signs of spring include maple forests awakening and a plethora of outdoor art awaiting visitors. With more than 3,000 sugarmakers in residence, Vermont is the top maple syrup producer in the United States, generating over one million gallons annually. This year, pair your visits to the state’s famed maple sugarhouses with outdoor arts exploration. From Maple Open House Weekend, March 23 and 24, to the Vermont Maple Festival, April 26 to 28, the opportunities for exploring Vermont arts and savoring the season are as ample as maple is sweet. The state’s arts stats are as impressive as its maple mastery. Vermont ranks third in the nation for artists as a percentage of the workforce, second for writers, and eighth for musicians and photographers. Enjoy the outdoors this spring by feasting on both the artistic and the agricultural bounty of Vermont. You may even feel inspired to practice your own art skills by drawing, painting, or photographing Vermont’s maple and country scenes. Share using the hashtags #VTarts and #VTmaple; we’ll repost some of our favorites! St. Albans is well-known for hosting the Vermont Maple Festival, which takes place annually in April. Locals know that there’s an artistic ode to sugaring in town: a 6’ by 16’ mural titled “Sugaring Off” by Phillip Von Saltza can be found in the town’s Federal Building. 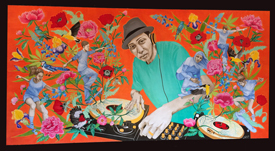 Visitors can also enjoy “Haying,” another onsite mural by the same artist. Both were New Deal paintings commissioned in 1939. The Branon Family Maple Orchards, in Fairfield and Bakersfield, are run by seventh generation maple producers. Nowadays, they’re utilizing 18 solar panels across the sugarbush, or as they say, “tapping the sun.” Nearby and open for Vermont Maple Open House Weekend are Bouchard Family Dairy in Franklin and Leahy’s Maple Farm in St. Albans. Jeffersonville has two new public art gems, which also hold the title of the largest painted murals in the state. Front and center at a busy roundabout in town, you’ll see the North and South Silos, murals painted by Artist Sarah Rutherford. 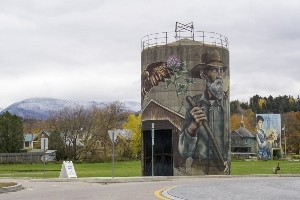 The North Silo represents the summer and autumn seasons, with an elder male farmer depicting the current or past generation. 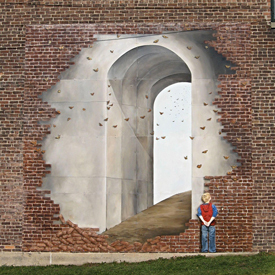 He looks towards the child on the South Silo, a representation of the future generation on a backdrop of winter and spring. Both feature state symbols such as the hermit thrush and red clover. If you want to take a break from the great outdoors, visit the Bryan Memorial Gallery on Main Street that has permanent and rotating exhibitions of the finest landscape painters in New England. At Snowshoe Pond Maple Sugarworks in Enosburg Falls, Barbara and George Salg have been producing maple products for generations. In Jeffersonville, at Marsh Family Sugarworks, Diane and Ryan Marsh manage over 10,000 taps. Both will be open to visitors during Vermont Maple Open House. Sweets shoppers can delight in a visit to the Vermont Maple Outlet on Route 15 in Jeffersonville. At Boyden Valley Winery & Spirits in Cambridge, Maple Open House activities include free sugar on snow. See their sugarhouse in full swing and sample syrup inside. Maple butter yeast donuts will be available for purchase — but not for long! Inside the winery, enjoy maple cocktails, tours, and tastings of maple wine and maple cream liqueur. Public art abounds in Vermont’s Queen City; hundreds of acres of sugaring are just a short drive away. Along the waterfront, the city is proud to tout the Andy A-Dog Williams Skatepark and a mural celebrating his life. On St. Paul Street, you’ll find the towering Hummingbird Mural painted by Mary Lacy. Just south of Burlington, the Shelburne Museum offers a plethora of opportunities to view art — from contemporary painting to historic, hand-painted carousel figures. Those willing to drive just 15 minutes from downtown Burlington can meet sugarmaker Fred Bell at Backyard Boilers in Colchester. Hours are limited to a small window of the year, but during open house, visitors can watch traditional methods of sugaring on a “gentleman’s farm” with chickens, geese, and ducks. Maple syrup, maple candies, and maple butter will be for sale. “Eating of Morals” by Justin Kenney in the Vermont Arts Council Sculpture Garden. Visitors to the State capital can stop at the Vermont Arts Council on State Street. Open to the public, tourists and locals alike can explore the Council’s year-round outdoor sculpture garden. A public/private collaboration, the sculpture garden features rotating two-year exhibits of contemporary sculpture by Vermont artists. Designed in 2002 by Burlington landscape architects H. Keith Wagner and Associates, it offers a place to picnic or engage in quiet reflection in Montpelier’s downtown. You’ll want to visit Morse Farm Sugarworks a 200-year-old family sugaring operation led by the inimitable Burr Morse. Open and serving maple creemees year round, Morse Farm offers free sugar house tours and syrup tastings, a country store, multimedia displays in a real woodshed theater, nature trails, and an outdoor farm life museum. Sprinkled throughout the grounds are whimsical wooden folklife characters carved by Burr himself. 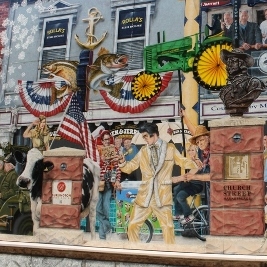 One of several murals in Rutland created by Kathryn Palmer-Wiegers. Photo courtesy of Vermont Public Radio. At Green’s Sugarhouse, nestled in Finel Hollow in Poultney, the tradition of maple sugaring has been passed down through six generations. Though open year round for tastings and guided tours, Pam Green recommends calling ahead (802.287.5745). The whole sugaring process — from their 5,000 trees to the jug on your table — can be seen during Open House Weekend. 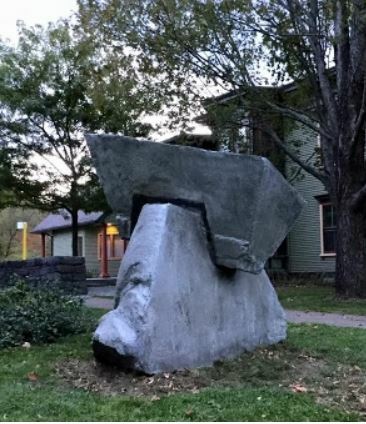 Home to the largest sculpture garden in the state, the Southern Vermont Arts Center (SVAC) offers outdoor art plus an historic mansion and art gallery. SVAC’s stunning sculpture park and gardens provide a mix of culture and contemplation for art lovers and outdoor enthusiasts alike. With commanding views of the Green and Taconic Mountains in all directions, the park offers more than 120 acres of forest-land and trails, a perfect spot for cross country skiing, snowshoeing, picnicking, and dog walking. Dutton Berry Farm has three well-known farm stands across Southern Vermont where you can purchase maple syrup and other specialty products. Visitors will love seeing the sugarhouse in operation at the Manchester location, where each year, they put out more than 3,000 taps. The farm is open seven days a week. Wild Farm Maple is an old hill farm on the lower slopes of Mount Equinox, chopped out of the wilderness at the end of the 18th century. The Clay family arrived to restore the property in the 1960s and began producing maple in 1972. They welcome visitors during Vermont Maple Open House weekend. Has Vermont’s sweet season or its arts scene piqued your interest? Find other maple and art adventures at Vermontmaple.org and VermontArtsCouncil.org.